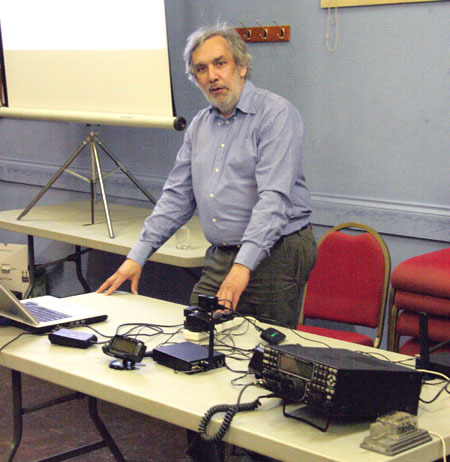 John Regnault, G4SWX started by asking the assembled 25 members what they might do about getting too old to work on antennas and masts. Or living in sheltered accommodation where masts and wires were not allowed. That could even apply to young persons living in blocks of flats with the associated problems of TVI, QRM and antennas. John’s solution is to operate remotely! Of course, there are strict regulations regarding unattended operations. He had to make sure the remote antenna site and equipment was very secure and measurers had to be taken to be able to shut down quickly in the event of problems. The link between his home rig or laptop is via Wi-Fi over a protected circuit using ‘off the shelf’ equipment. Of course, John’s considerable experience in IT and Security has helped immensely and the results speak for themselves with DXCC on 2M EME for starters.